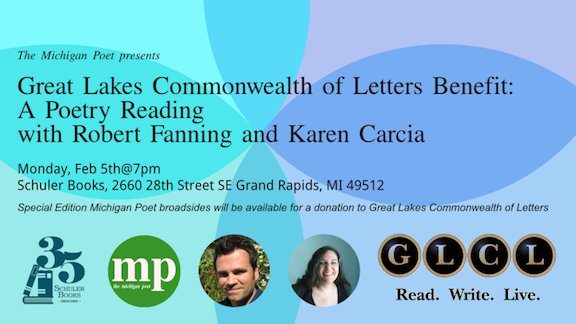 Congratulations to Karen Carcia, whose poem “Slant” won first place in The Michigan Poet’s Great Lakes Commonwealth of Letters benefit contest. She will be featured at a benefit reading alongside guest judge Robert Fanning on February 5th at Schuler Books in Grand Rapids, MI. In addition, “Slant” will be printed as a special edition Michigan Poet broadside. Karen Carcia is Adjunct Assistant Professor of Book Arts at the UICB. She trained as a poet at Indiana University and Western Michigan University before completing studies at the UICB. Carcia teaches the first year Graduate Book Arts Seminar to incoming MFA Candidates, as well as a variety of courses on artist book practices. As well as teaching, she is also the Mixed Media Editor of Prompt Press.